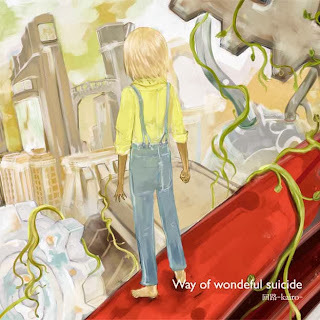 I was considering translating all songs from World Pulse, but when I discovered the old album of Kairo's called Way of Wonderful Suicide (as the final song on that album, and the song that was rerecorded for World Pulse and translated in another post), I decided to translate March of the Traveler instead. この先には何があるの？ Kono saki ni ha nani ga aru no? What's above this place? あなたは気付いてくれますか Anata ha kidzuite kuremasu ka Do you notice me? この空の星の名前もあなたが教えてくれたんでしょう? Kono sora no hoshi no namae mo anata ga oshietekuretan deshou? Weren't you the one to teach me the names of the stars? あなたは気付いてくれますか Anata ha kidzuite kuremasu ka Do you see me?